When it comes to fat loss protein powders, Max’s were one of the first supplement companies to introduce one to the Australian market. Since then, Super Shred has become one of most popular products in the weight loss protein powder category. In 2016, Max’s have decided to revisit the category again with the release of Max&rsquo;s Shred System – Fat Stripping Complex. Let’s take a look at what’s in it and how it compares with its predecessor. Anabolic Protein Blend – Hydrolyzed Whey Peptides, Whey Protein Isolate (WPI), Whey Protein Concentrate (WPC) and Casein. Fat Burners – Conjugated Linoleic Acid, Green Tea Extract, Raspberry Ketones, African Mango Seed Extract, Guarana, Caffeine and Acetyl L-Carnitine. Each 30g serve of the Shred System provides only 110 calories, 22.6g of protein, 3g of carbs and 0.7g of fat. Max’s has spent a considerable amount of time formulating the Shred System and is definitely an updated and one could argue a better version of the original Super Shred. Max’s have decided to utilise a stronger and more sustained protein blend, which helps to support muscle building over a longer period of time. In addition, the array of weight loss ingredients have changed to reflect new trends and emerging science. The carb blocking complex has been simplified since Super Shred, but still retains the core ingredients which help to limit both carbohydrate breakdown (phaseolamin1) as well its conversion into fat (garcinia cambogia2). Green coffee extract has also been shown to suppress fat accumulation3. Their range of fat burner ingredients have also been slightly updated. The addition of caffeine and acetyl l-carnitine helps to offer benefits in terms of appetite suppression, boosts to fat metabolism and improved focus and mental performance. This last aspect is often underlooked, but maintaining concentration and motivation on a weight loss diet can be a struggle. Shred System aims to correct that issue. The rest of the ingredients in the fat loss complex are really to support fat metabolism, offering the perfect combo with the lean muscle building benefits of their protein blend. The updated formula of Shred System is quite good and as previously mentioned has definitely improved over Super Shred. However, two issues are important to highlight. The addition of glutamine and BCAAs, whilst beneficial, is somewhat unnecessary, since you’ll be getting a good amount from the protein blend already. It would be preferable if they were able to exchange these ingredients for a higher dose of the fat loss ingredients. The only other minor issue is the choice to include Raspberry Ketones and African Mango Extract. Considered two of the most popular ingredients at the moment for fat burning, the research on these ingredients just isn’t as strong as for some of the other ingredients such as green tea extract and caffeine. However, the research is positive and promising, so their inclusion isn’t completely wasted. 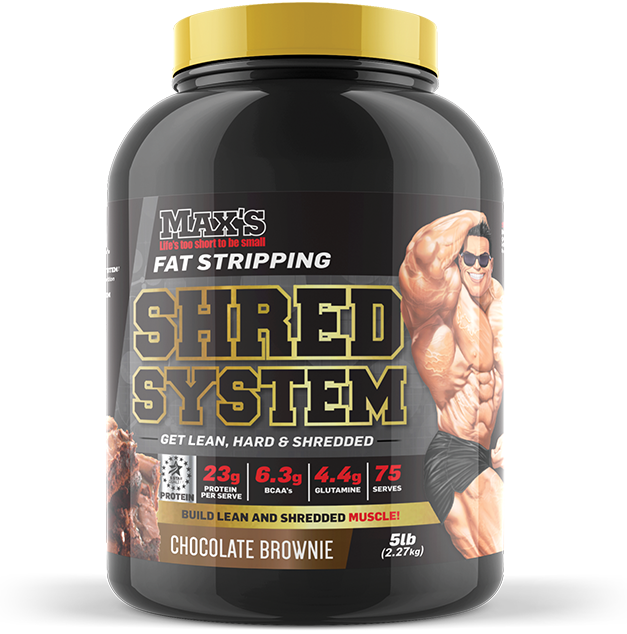 Max’s Shred System is available in three flavours including: Chocolate Brownie, Choc Honeycomb and Vanilla Smoothie. Similar to many of Max’s other protein powders, each flavour mixes easily with minimal clumping and residue. The flavours themselves are all quite tasty. They mix into fairly liquidy shakes, and the flavours aren’t sickly sweet, unlike many other fat loss protein powders. If you’re after a flavoured milk type shake rather than a milkshake like one, Max’s Shred System should be right up your alley. All three flavours are definitely an improvement on the Super Shred. Max&rsquo;s Shred System is an updated and improved version of Max’s Super Shred weight loss protein powder. Carrying over the best qualities of the previous supplement and adding in some extra components, Shred System offers a well blended supplement that aims to help build muscle and boost fat loss at the same time. Although some of the added components could have been left out, overall, Max’s Shred System is a much more focused product that can be a great addition to anyone wanting to drop their body fat percentage. 1 Barrett ML, Udani JK. ‘A proprietary alpha-amylase inhibitor from white bean (Phaseolus vulgaris): a review of clinical studies on weight loss and glycemic control.’ Nutr J. 2011 Mar 17;10:24. 2. Preuss HG, Rao CV, Garis R, Bramble JD, Ohia SE, Bagchi M, Bagchi D. ‘An overview of the safety and efficacy of a novel, natural(-)-hydroxycitric acid extract (HCA-SX) for weight management.’ J Med. 2004;35(1-6):33-48. 3. Onakpoya I, Terry R, Ernst E. ‘The use of green coffee extract as a weight loss supplement: a systematic review and meta-analysis of randomised clinical trials.’ Gastroenterol Res Pract. 2011;2011. pii: 382852. Epub 2010 Aug 31.